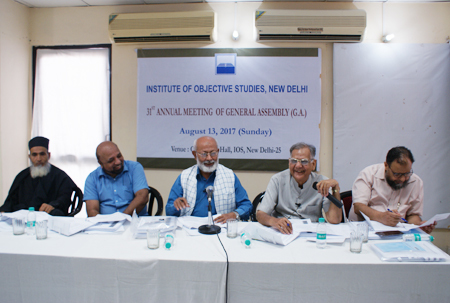 The Institute of Objective Studies (IOS) organised a lecture on “Constitution and Constitutionalism in Indian Context” on August 13, 2017 at the conference hall of the Institute to mark the 31st Annual Meeting of General Assembly. Presided over by the chairman of Delhi State Minorities Commission, Dr. Zafrul Islam Khan, the lecture was delivered by the former Dean, faculty of Social Sciences, JMI and Secretary General, IOS, Prof. ZM Khan. In the lecture, he insisted that a carefully crafted Constitution had been overtly based on the sound principles of Constitutionalism, particularly mentioned in the Preamble. India as a nation was fortunate that it had a long history of liberation movement involving people in general for over 150 years. He said that the participation of common people also provided new vigour and rigour to values of Constitutionalism. India might easily claim as a nation to be the biggest liberal democracy in the world. Democracy did not mean majoritarianism or dictatorship of votes, he clarified. Prof. Khan noted that the Constitutionalism ensured limited government. Challenges and threats to the Constitution were rampant and there was an emerging concern to save the Constitution and protect Constitutionalism. He said that the best way to do it was to spread awareness through the constant analysis and evaluation of the situation prevalent in society. Referring to the sharp attack on the ex-Vice President of India, Mohammad Hamid Ansari for speaking about continuing atrocities on Indian Muslims, he said that they were better placed to understand the situation today than the Ummah in other parts of the world. What was happening today was not accidental, but formed part of a highly planned strategy over a period of about 100 years. The Constitution evolved taking in its strides values, traditions and paradigms. Gandhiji’s entry into the national movement galvanised people to yearn for freedom. He left the Congress Party and mobilised people irrespective of their caste or religion. It was after a long-lasting struggle that the people of India adopted a remarkable Constitution. Justice, liberty, equality and fraternity were made the corner-stone of the document. 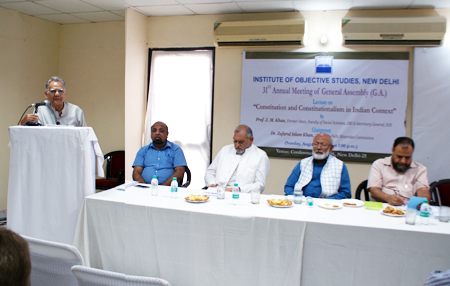 Prof. Khan said that four elements of government determined the success of a Constitution. These were the structure of governance, functioning, process and the environment of governance. As far as the environment was concerned, it was being constantly vitiated by the RSS. Today, RSS had money, muscle and political power, and after consciously grasping the Constitution, it had started diluting the process of governance. Bureaucracy, which was expected to follow the Constitution in letter and spirit, had failed in its duty and instead curried favour with the political leadership. This wrought havoc with universities and other seats of learning which were deprived of their independence. JNU, he said, was a case in point where no attempt was spared to destroy its character of independent thinking and free enquiry. 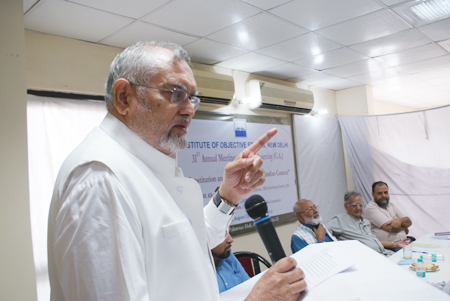 Emphasising that the constitutional values must be protected at all costs if the country had to survive as a liberal democracy, he maintained that the entry of the corporate sector into the media had made matters worse. He said the veteran journalist Rajdeep Sardesai was snubbed by the business magnate Mukesh Ambani, who said that he did not like him. Dissent was a must for a healthy democracy, he stressed. Commenting on the supremacy of the Constitution, Prof. Khan said that all laws had to be subordinated to the Constitution. It was the Constitution that defined the inter-relationship of various organs of the government. The Constitution defined centre-state relations, relations of citizens with the state, safeguards like Fundamental Rights, Fundamental Duties and the Directive Principles of State Policy. These provisions had been made in the Constitution to leave no scope for authoritarianism of the political executive. In order to checkmate the high-handedness of government, institutions like Comptroller and Auditor General and the Union Public Service Commission had been created and their reports were tabled and debated in the Lok Sabha. He explained that the Constitution and Constitutionalism went together and both were adjusted to each other. While quoting the Supreme Court’s ruling that the basic structure of the Constitution could not be changed, he said that the rule of law, conventions and checks on the authority of government made the system of governance smooth. However, of late, due to the emergence of majoritarianism, the marginalised sections and those with no voice had become victims. This was reflected in the lynching of innocent people by cow vigilantes. This had created a sense of insecurity among these sections. While endorsing the views of the former Chief Justice of India, Justice AM Ahmadi, that an environment in which things were moving in different directions, there was no guarantee that judges would not be amenable to influence, he said that they too were influenced. He observed that this could be in the name of judicial activism. Underlining the role of the Fourth Estate, he said that it could put an effective check on government. 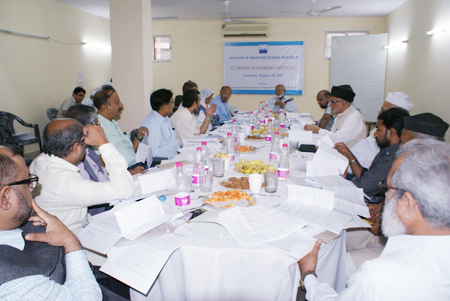 Similarly, NGOs could also actively contribute to the effective functioning of democracy. Elected representatives of the people, who had a fixed term of five years, could prove instrumental in the process of governance if made accountable. Political parties were also an important segment in a democratic set-up. He held the Congress Party, too, responsible for the present state of affairs in the country as it played the soft Hindutva card prompting the other communal outfits to come full circle. He said that the role of big business, corruption and non-utilisation of funds in sectors like education, health and social welfare had further complicated matters. All-out efforts were needed to be made by the people who had a concern for the country to protect democracy and democratic rights, he concluded. In his presidential remarks, Dr Zafrul Islam Khan pointed out that it would have been better if the lecture had also discussed the Constitution from Islamic point of view. The Indian Constitution is based on the western concept of democracy and was derived from British and French Constitutions. It was somewhat a replica of the Swiss Constitution. He said that much before the western constitutions were drafted, Prophet Mohammad (PBUH) presented the Constitution of Madina which was an ideal set of rules for governance. This was strictly followed by the Caliphs (RA) who meted out justice to all without prejudice. The second Caliph, Hazrat Farooq (RA) went to the extent of punishing his son, who was flogged till he fell unconscious and died. He suggested that an all-compassing alternative Constitution be given to address present-day issues. He said that the process of re-drafting of the Constitution was on in several countries, including Iran where a new Constitution had been adopted. In Egypt, it did not succeed. Raising the issue of the state of Hyderabad and Jammu and Kashmir, he said that different yardsticks had been used in these two states. There were instances where the apex court exceeded its brief. The definition of Hindutva as a way of life by the Supreme Court was a case in point. He held that the Constitution was not being fully followed as the archaic laws enacted by the British government were still applied. In this connection he cited several laws, including, IPC, CrPC, Indian Evidence Act, Shariah Act 1935, etc. However, the government was unwilling to repeat the obnoxious Disturbed Areas Act. He said these laws were made by the British to enslave Indians and it was a high time to annul them. Chairman of IOS Dr Mohammad Manzoor Alam wondered whether the observations of some judges raised the question if the verdict of seven judges against six dissenting ones with regard to change in the basic character of the Constitution would not be overturned by subsequent judges. It was quite possible that a larger bench would reverse the majority judgment. It was also a matter of concern that the tilt towards a particular ideology among the judges for some time now was palpably evident. Besides, caste distinction among judges too came out in the open. The treatment meted out to Justice Karnan of the Calcutta High Court at the hands of Supreme Court was still fresh in people’s memory. As things stood now, nobody could say for sure if the present structure of the Constitution would remain intact. 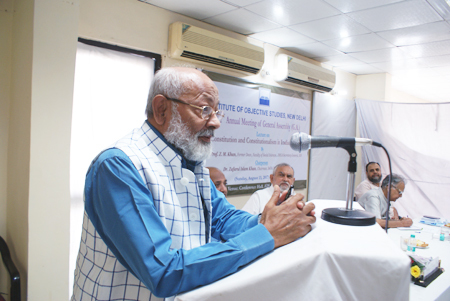 Assistant Secretary General, IOS, Prof. M Afzal Wani, while proposing a vote of thanks, remarked that Allama Iqbal had given the message of unity decades before the Constitution came into being. He said that efforts were on at the international level to formulate laws to bring about uniformity. Dr. Alam told the meeting that the IOS was on the look-out for such books in social sciences like history and sociology that presented an alternative narrative. He asked the members to send their suggestions for inclusion in the four-volume book on the role of Muslims in the freedom struggle. Making an announcement that the books that did not form a part of the IOS project, but were valuable in content, might also be considered for publication. He called upon scholars to come out with literature on social sciences that could serve as an alternative to the conventional content. He asked the members to regularly access the IOS website, the Minaret and other sites that hosted articles on current topics. He informed that the regional chapters of the IOS had been advised to hold seminars on various issues in their areas by inviting local scholars and well-known figures. 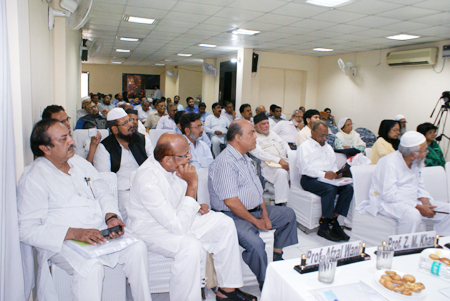 The role of Muslims in pre-and-post Independence period could be one of the topics of such seminars. 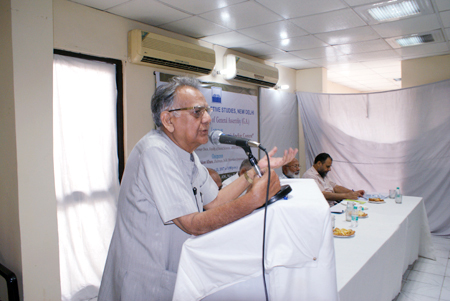 Giving details of various programmes to be organised in the months to come, he said that an expert on economic affairs, Dr Amirullah Khan, would speak on the GST on August 26, 2017 in Delhi. On this occasion, Prof. ZM Khan and the Finance Secretary, IOS, Prof. Ishtiyaque Danish, also expressed their views.